Last night we broadcast the first episode of the Down the Rabbit Hole radio series live from the Resonance FM studio in London Bridge.We were delighted to have author Susie Day and author/illustrator Tom Percival to join us as our studio guests, and we talked about three brilliant new books coming out in June: Tiny: The Invisible World of Microbes by Nicola Davies and Emily Sutton; Murder Most Unladylike by Robin Stevens; and Lobsters by Tom Ellen and Lucy Ivison. Now we’re looking forward to our next show which will be broadcasting at the end of June – check out the Down the Rabbit Hole blog for more info or follow us on Twitter @dtrhradio for the latest updates! I’m very excited to share the news that Down the Rabbit Hole is returning to Resonance 104.4fm next week, as a series. Following the one-off show which was broadcast earlier this year, Melissa, Louise and I are teaming up to continue the programme in a a regular monthly slot. Each half-hour episode will feature special guests (authors, illustrators, industry experts) who will be joining us to discuss a selection of new titles, ranging from picture books to young adult fiction, as well as news and feature content from the world of children’s books. The first episode is being broadcast live on Tuesday 27 May at 5.00 pm, and will be repeated on Sunday 1 June at 7.00 am. You can tune in online at resonancefm.com or those in London and the surrounding area can listen at 104.4fm. The programme will also be available to listen to as a podcast after the show. Special guests for this first episode will be Susie Day, author of the brilliant Pea’s Book series, as well as teen and young adult novels; and Tom Percival, picture book creator of such delights as Herman’s Letter, and illustrator of Derek Landy’s bestselling Skulduggery Pleasant series. 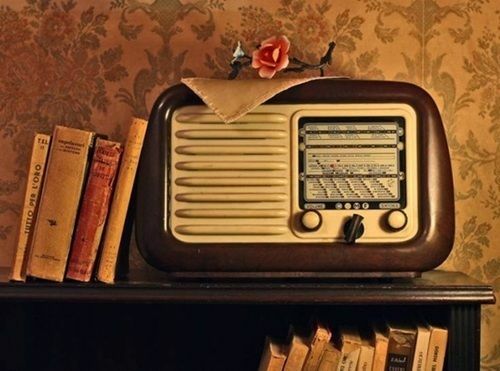 Do tune in if you can – and for more about the series, see our shiny new tumblr site http://www.downtherabbitholeradio.tumblr.com You can also now follow us on Twitter at @dtrhradio. 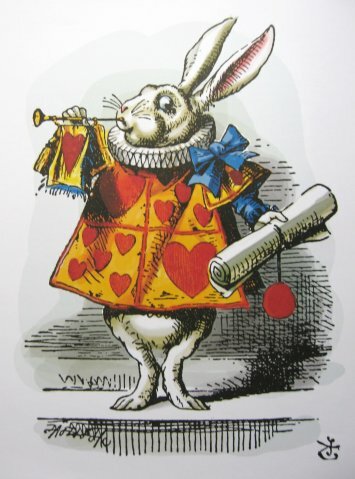 The idea for Down the Rabbit Hole originally came about following the recent discussions about the lack of proper coverage of children’s books in the media. Even though children’s books account for almost a fourth of all book sales in the UK, they receive only a tiny proportion of media coverage compared to books for adults. That has always seemed extraordinary to me – not just because so many families are interested in children’s books, but also because they are such rich artworks in their own right – and just as worthy of ‘proper’ discussion as adult literature. 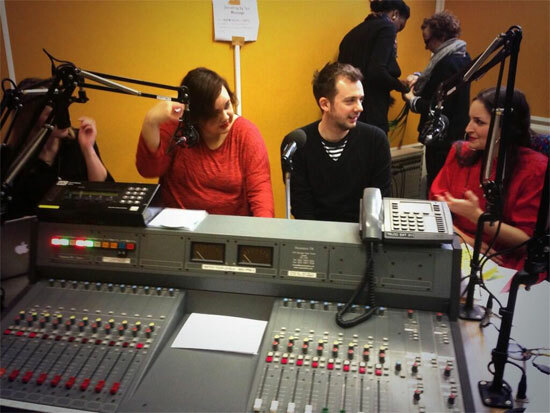 The opportunity to do the show came about when arts radio station Resonance FM offered up one of their Clear Spot sessions, which are set aside for experimenting with new programme ideas. I’m a big fan of Resonance, who have a hugely diverse and interesting programme, and they seemed the ideal home for a deeper discussion of children’s literature. I had envisioned the show as being a bit like BBC Radio 4’s Front Row, but exclusively for children’s books, so my first job was to find a panel to discuss a selection of books with me. Happily, I was lucky enough to find four brilliant and enthusiastic speakers to be involved –Tanya Byrne, Melissa Cox, Laura Dockrill and Alex T Smith. Feature items were provided by Nikesh Shukla, who gamely became our ‘roving reporter’ and interviewed graphic novelists the Etherington Brothers in Bristol; the Hot Key Books team, who gave us a peep behind the scenes into children’s publishing; and agent extraordinaire Louise Lamont, who offered up her tips on how aspiring children’s writers and illustrators could attract an agent’s attention (with added Antonio Banderas). I was also lucky enough to have contributions from the likes of Philip Ardagh, Liz Pichon, Tom Moorhouse and James Dawson, who generously shared their thoughts on ‘the book they would give to their 10-year-old self’ as part of the campaign to celebrate the 10th anniversary of the Waterstones Children’s Book Prize. Recording the show was a bit nerve-racking – I’d done one ‘down the line’ radio interview before, but never set foot in a proper recording studio, and I was feeling a bit anxious as we sat in a Southwark cafe chatting before the pre-recording session. Thankfully I had an exceptional bunch of speakers at my side and Resonance were welcoming and made the technical side super easy for us. The recording session ended up being really good fun and we could happily have gone on for another hour, chatting about our favourite spreads from Jane, the Fox and Me, listening to Laura read from her new book Darcy Burdock: Hi So Much, talking about why The Worst Witch is so brilliant, and discussing what books we’d have given to our 10-year-old selves. 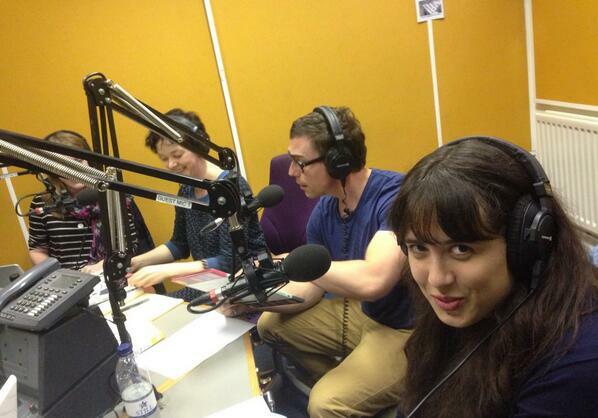 #downtherabbithole from @ResonanceFM. Proper, intelligent conversation abt children’s books on the radio. Why don’t we have more of this? Huge thanks to everyone who took part in the show, to Resonance, and to everyone who tuned in. We hope to find a way to continue the show, so if you enjoyed it do share your feedback by leaving a comment or tweeting with the hashtag #DownTheRabbitHole. Just a quick post about something rather exciting that’s coming up next week. I’ll be producing and hosting a special one-off radio programme all about children’s books on Resonance FM – Down the Rabbit Hole. The programme features four brilliant panellists, who’ll be joining me to talk about some of the best new children’s and teenage books – Tanya Byrne, Laura Dockrill and Alex T Smith, plus Waterstones Children’s New Titles buyer (and all-round children’s book guru) Melissa Cox. As well as talking about some great books, the programme will also feature everything from author interviews to tips for aspiring children’s writers, to a peek behind the scenes in children’s publishing – and even hopefully a few Alice in Wonderland-themed songs along the way! You can listen to the show on Tuesday 18 February at 8.00pm on 104.4FM or online at http://www.resonancefm.com and it will also be repeated on Wednesday 19 February at 9.00am. If you do have a listen, I would love to hear what you think. We’re planning to continue the discussions on Twitter after the show so please do join in and tweet me your feedback using the hashtag #downtherabbithole.